The Boroondara Community Plan sets the long-term strategic direction for our organisation. As shown in the diagram below, it also directly informs the Council Plan, the Municipal Strategic Statement and Council strategies, plans, policies and actions. The plan will be implemented through our annual commitments set out in Council’s Annual Budget. 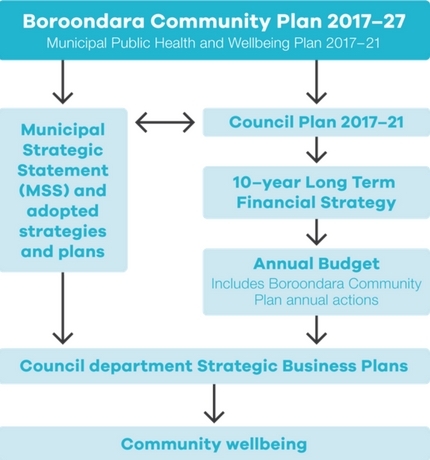 To ensure the Boroondara Community Plan continues to meet community needs, we have developed a comprehensive evaluation framework to monitor our progress toward achieving the strategic objectives and strategies set out in the plan. actively consult the community through various channels, including the annual Boroondara Community Satisfaction Survey. We'll review the plan each council term (every 4 years) to ensure we stay aligned with new trends, demands and changes to community and government priorities. We will refresh and update the plan in line with the next new council term in 2021. For other questions, comments or concerns, contact the Community Planning and Development Department on 9278 4753 or email [email protected]. Read the full Boroondara Community Plan 2017-27 - designed PDF, Boroondara Community Plan 2017-27 - text format or Boroondara Community Plan 2017-27 - PDF of text version.